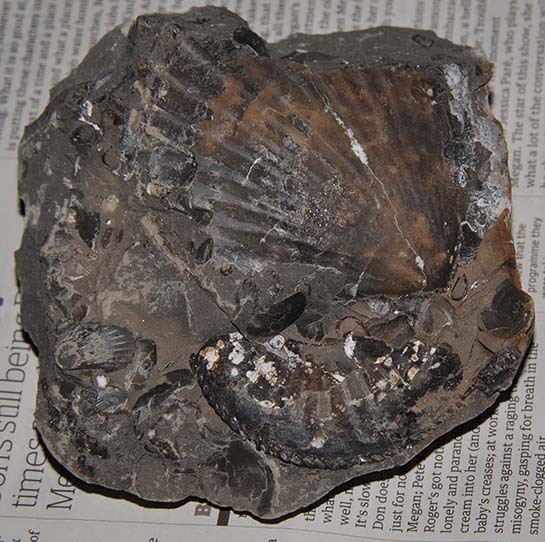 This is an Asteroceras blakei SPATH, 1925 from Robin Hoods Bay, found by Keeley and Adrian on the 20th of April, 2011 (guess what, my little red book told me that…). They entrusted this 10 cm ammonite to me for the preparation using my air abrader. After securing the remaining shell with a bit of liquid super glue, to stop it from flying away in the air stream (it easily does that by the way) , I prepped it and it came out like this. But this is not all that this little story is about, it´s more about finding out more about Asteroceras blakei. I usually at least try to take a look at the original description of the author. 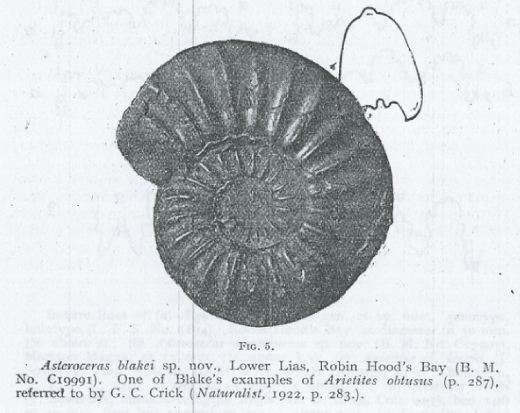 As you can see from the name, the original describer of this species, Leonard Frank Spath, did name this ammonite in 1925.
http://archive.org/search.php?query=creator%3A%22Yorkshire+Naturalists%27+Union%22, but sadly not the one from 1925. I sent out severall calls of help to the various forums I visit, but first to no avail. I had almost given up, when after almost 5 months later out of the blue I received a note from Dr. Rene Hoffmann, from the Ruhr University at Bochum, sending me copies of the two pages describing Asteroceras blakei – thanks again for that ! But that´s almost all that SPATH writes about this new species – I must admit I was somewhat underwhelmed for all the trouble it took to find this description ! 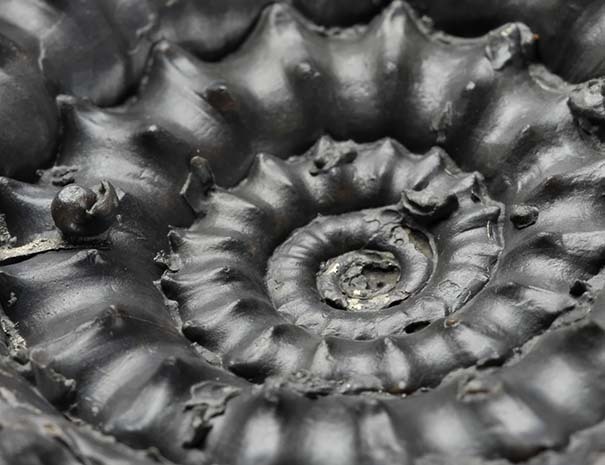 Thanks of course to Keeley and Adrian, for letting me borrow, prep & photograph the ammonite ! 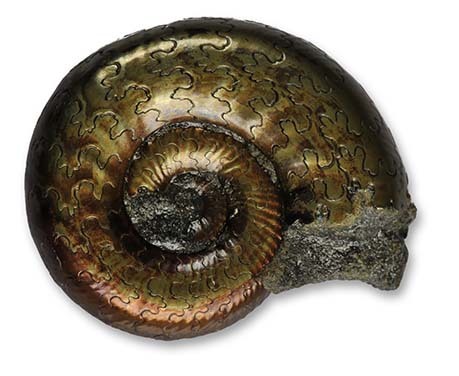 A Microderoceras birchi, shell fully preserved, with a tiny little ammonite sitting on one of the spines. There has to be a way to use this difference to remove the matrix without damaging the shell too much. 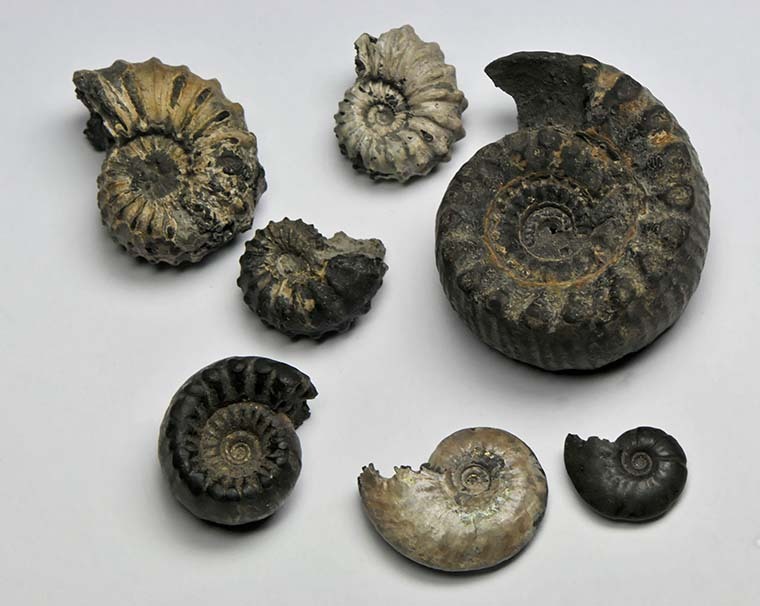 Most shell preserved ammonites in Yorkshire come from more or less hard nodules that formed around the decaying animal. 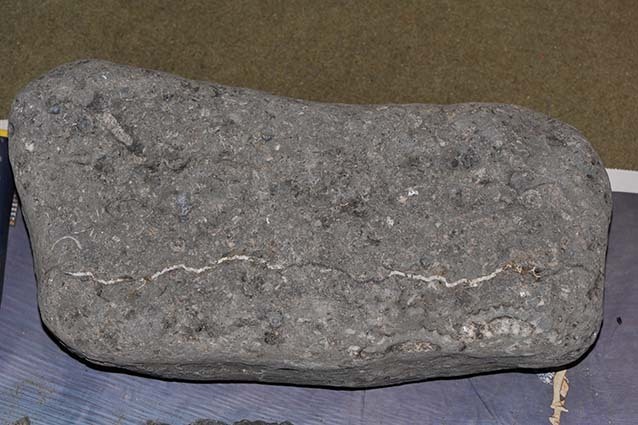 With some of the nodules, especially from some beds in the upper sinemurian, it is the hardness difference between shell and nodule that can be used to extract an ammonite with shell more or less intact. 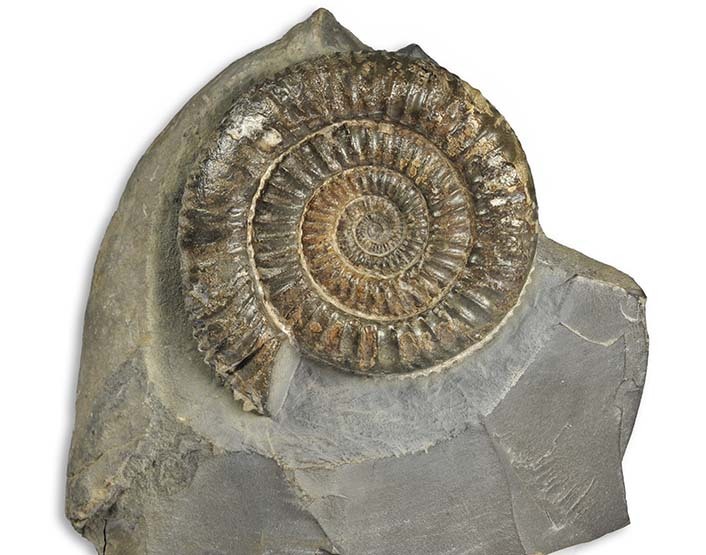 Generally ammonite shells are most commonly preserved in calcite that was transformed from the original aragonite. Calcite has a Mohs hardness (a relative scale of hardness from 1 to 10 with diamond being 10) of 3 – not really all that much, considering that the steel of a chisel or a prep needle has a Mohs hardness of between 5.5 and 6.5. So using a prep needle, you can scrape softer matrix off the shell, but you will always scratch it more or less, depending how careful you work. 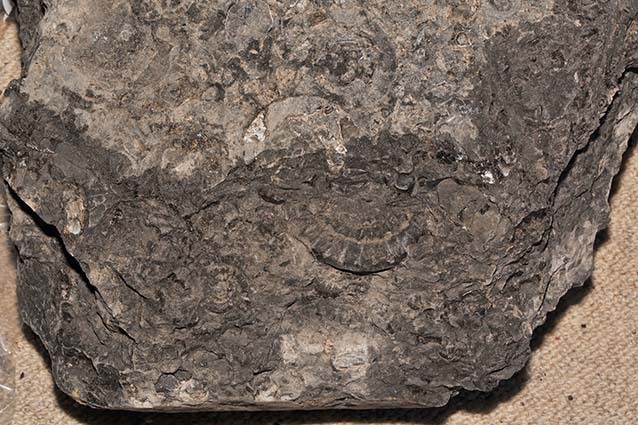 In recent years, air abrasive techniques have become affordable for collectors, in essence shooting small abrasive medium particles at the fossil using a compressed air stream, like a million tiny needle-pricks. The elegant thing about air abrasive technique is that you can (within boundaries) tailor your air abrasive medium to the hardness difference between matrix and fossil. A more commonly used abrasive medium is iron powder with a hardness of about 4, but almost anything is possible e.g. walnut shell powder , glass, aluminium oxide. Iron powder is quite popular in Germany because it is just slightly harder than calcite (it will “smear” ammonite shell just a bit) but harder than most soft shales, or oolithic sediments with a high silt content, is relatively cheap, and quite recyclable, i.e. you can re-use it many times. Another quite commonly used medium is aluminium oxide which you can use on harder matrices like limestone nodules as well, but with a Mohs hardness of 9, it will easily shoot holes through your fossil if you’re not really careful. Every collector endeavours to make his collection as complete as possible. Whatever your collection object, that goal becomes easier to achieve when you specialize on a certain sub-group. 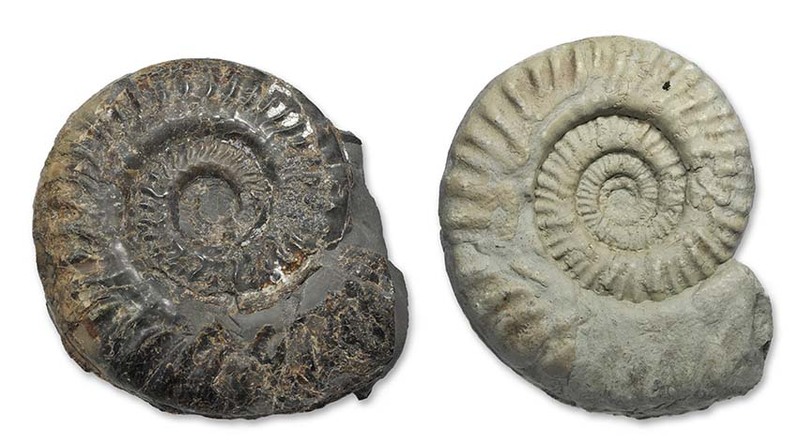 For me, this is ammonites, liassic ammonites, Yorkshire liassic ammonites. I do stray from that path once in a while and get tempted , e.g. 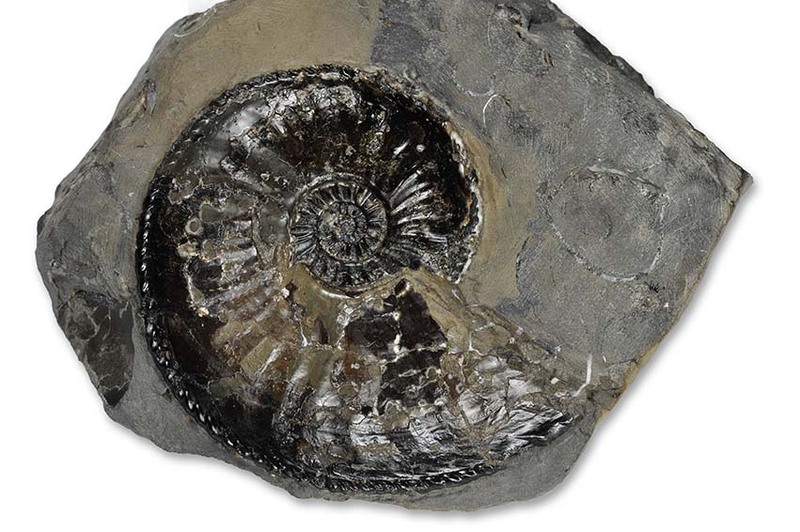 when a species cannot be found in Yorkshire at all, for example Prodactylioceras davoei , or can be found in another preservation from another location, like the beautiful white Marston Magna Asteroceras, Xipheroceras and Promicroceras, but that is really only the exception. Does the above all sound very apologetic to you ? 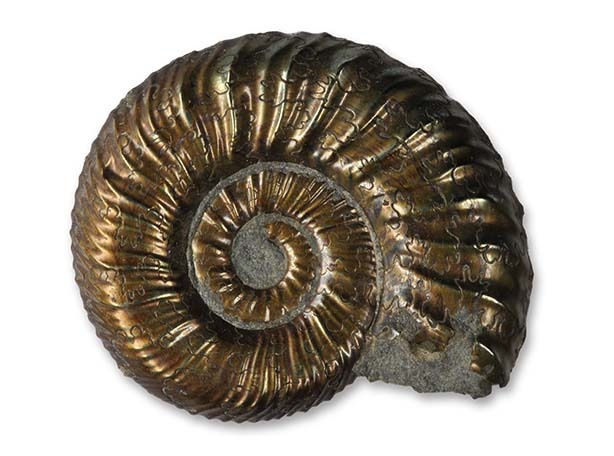 OK, I admit it : I do buy fossils, especially ammonites from time to time. Nothing to be ashamed of, really. I´m just human. 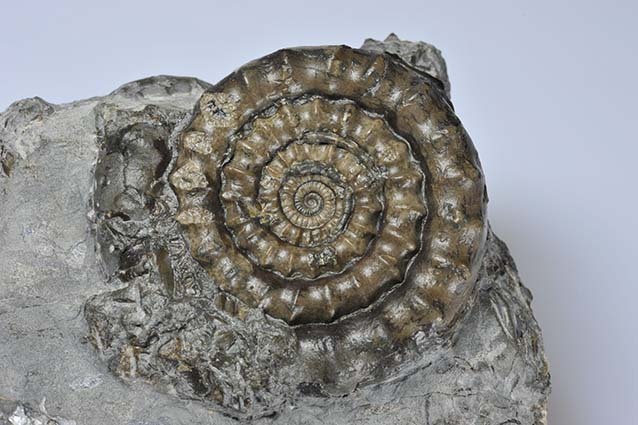 This beautiful Paltechioceras planum from the Holderness Coast came from fossilsdirect. 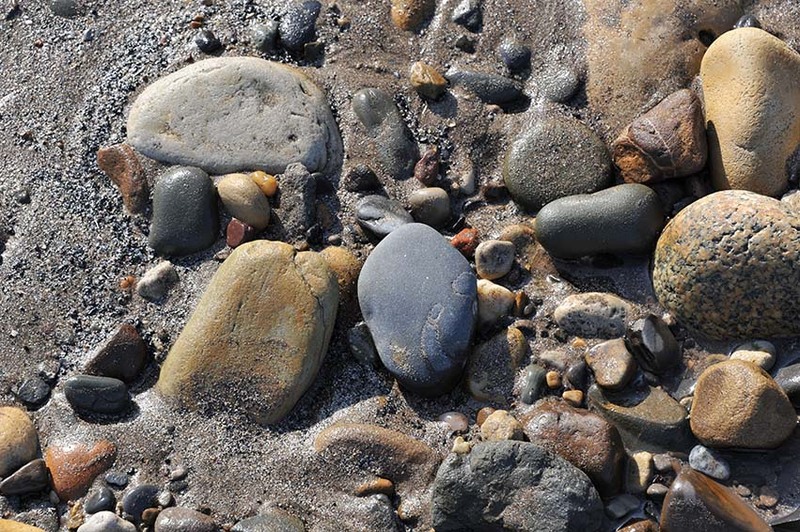 It is a species that should occur at Robin Hoods Bay as well, but I´ve never found it there yet. 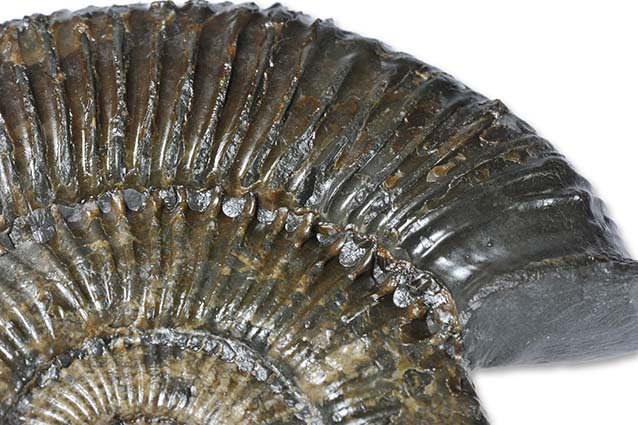 The ribbing on this species is not as dense as on Paltechioceras tardecrescens. This irresistible (I´m only human !) Dactylioceras (Orthodactylites) cf. 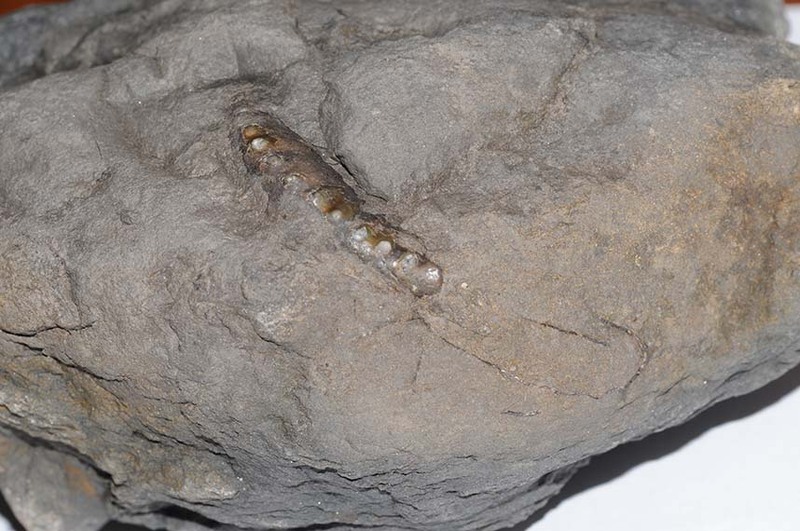 crosbeyi came from Yorkshire Coast fossils. Those thick variants of the Dactylioceras (Ortodactylites) genus are ever so rare, this is a particularly nice specimen and also very nicely prepped. we think it comes from the ovatum beds and the type of nodule it´s in seem to confirm that- this is one I´d like to check against some museum holotypes. I do sometimes buy from ebay as well, very occasionally you can get a bargain there, but you have to know what to look for, and bidding for really good stuff can sometimes be fierce, exceeding the price that you would pay in a shop, simply because the group of bidders is global. 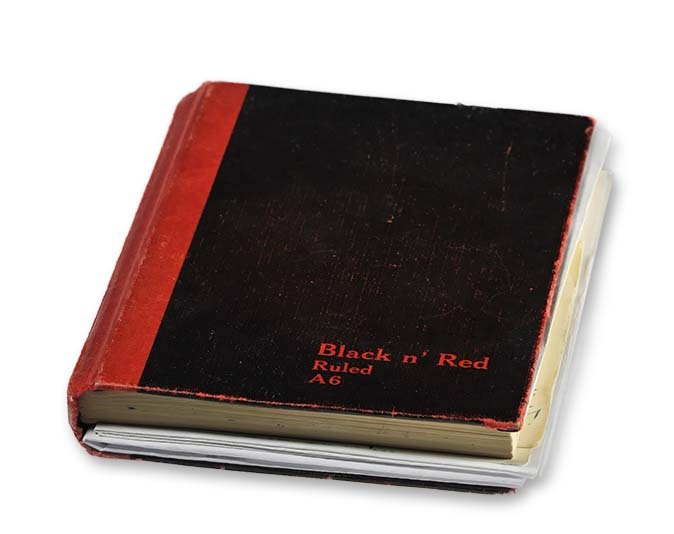 This is my little red book. I use it to keep track of all the finds I make during a collection day. Not when I´m out in the field (my memory is not that bad yet), but when I unwrap the fossils in the evening. I jot down the date, every fossil I found, it´s size, where I found it, any further interesting facts, since March 1991.
looked like before I prepped it. When later you have to e.g. remove the matrix of the fossil for whatever reason, you can still reconstruct what it looked like originally. Digital pictures cost nothing unless you have them printed, so I have a database of fossil pictures on my PC´s hard drive (and I do backup regularly). Digital pictures also do have the nice feature to tell you their “date of birth”, i.e. the creation date of their file from their so called “exif” (for exchangable image file format) data. If you set the date on your camera correctly (! ), you can use this information embedded in the picture to “find” every picture you made on a specific date on your computer´s hard disk. Together with the notes from my little red book, that makes it very easy to later on put the right information on the label of the fossil in the collection. This Crucilobiceras densinodulum was found on July 13, 2008 at Boggle Hole. but also very true for the next group of ammonites I´d like to show you : The genus Polymorphites. The name says, translated, “of multiple form”, and this alludes to the large variety of species / intra-species variation in this genus. 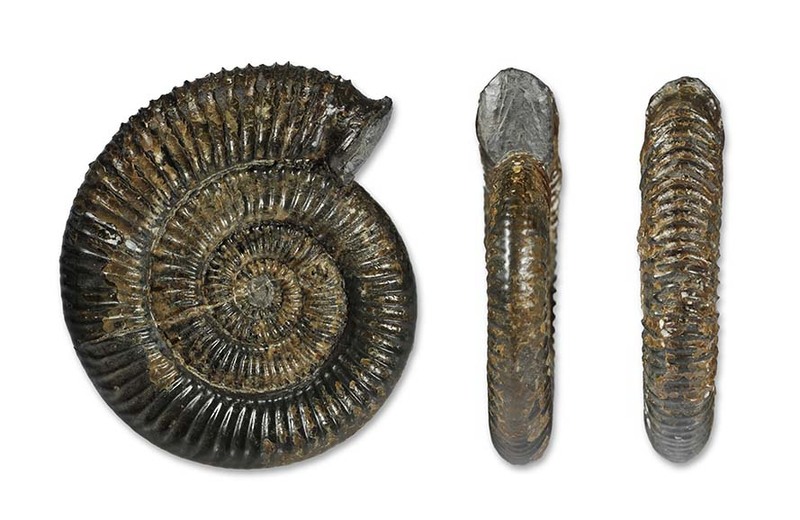 I´ve followed HOFFMANN 1982´s naming of the ammonites as subspecies. These are just the ones I could relatively easily put a name to since their relatively characteristic representatives, there are some more in my drawers that need sorting through and grouping. On the Yorkshire coast these can be found in the lower lias, jamesoni zone, polymorphus subzone, and their phragmocone is usually relatively small and preserved in stable pyrite while the body chamber is flattened or not preserved at all. I add the word “stable” here without parentheses or doubt, since this pyrite really seems to be stable, I´ve seen Polymorphites specimen in Whitby museum that probably have been found 100 years or longer ago and show no sign of the dreaded pyrite decay. 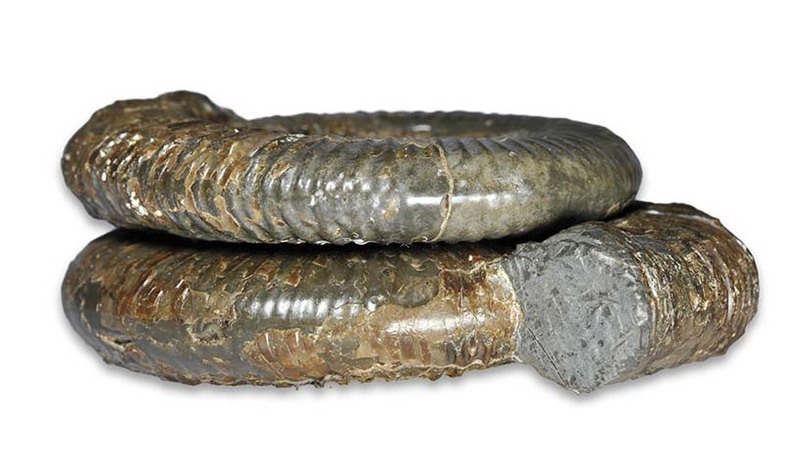 Due to more or less oxidization, and probably some intricacies in the composition of the pyrite, the ammonites show a natural light copper colour on the side embedded in the rock, while the upper side is usually poslihed to a more golden tone. On the ammonites shown I’ve only removed some small surplus of matrix with a needle, carefully brushed them under water with an old soft tooth-brush and gave them a good thorough but thin varnishing – they’ve kept their colour for many years. One where I did add the toothpaste to the toothbrush when cleaning it (it is really one of the best polishes !) of course lost its copper colour, but also stayed “silver” and decay-free after varnishing. It´s a special delight to seem them magnified on the screen at approx. 5 x, most papers only picture them “life-size”, and this is, as you see from the pictures titles, usually only between 2 and 3 cm. Glacial drift or not – that is the question here ! Unless we find such a lens in-situ, the question will probably remain un-answered. 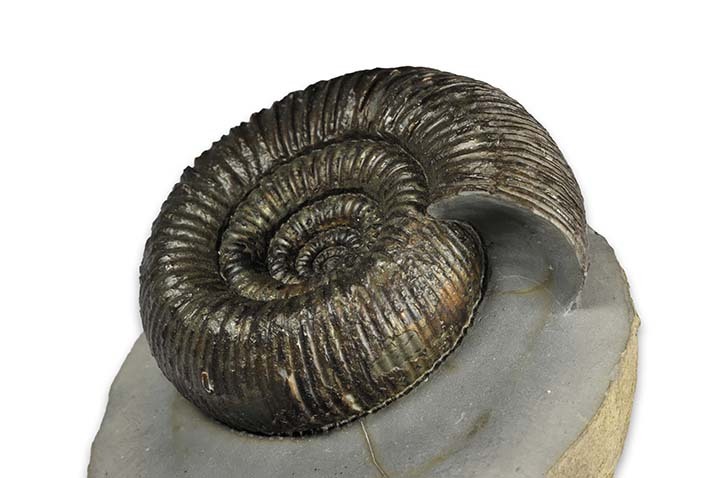 Whatever the source, the ammonites are rather nice, but relatively difficult to prep. 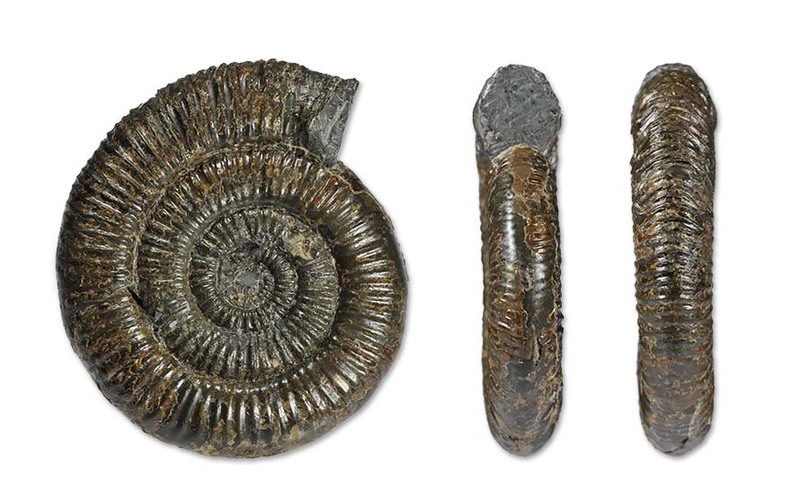 The matrix is full of small and large ammonites, crinoid remains, bivalves etc and is rather sticky. Here is an example that a friend (you know who you are) presented to me as a (generous) gift. 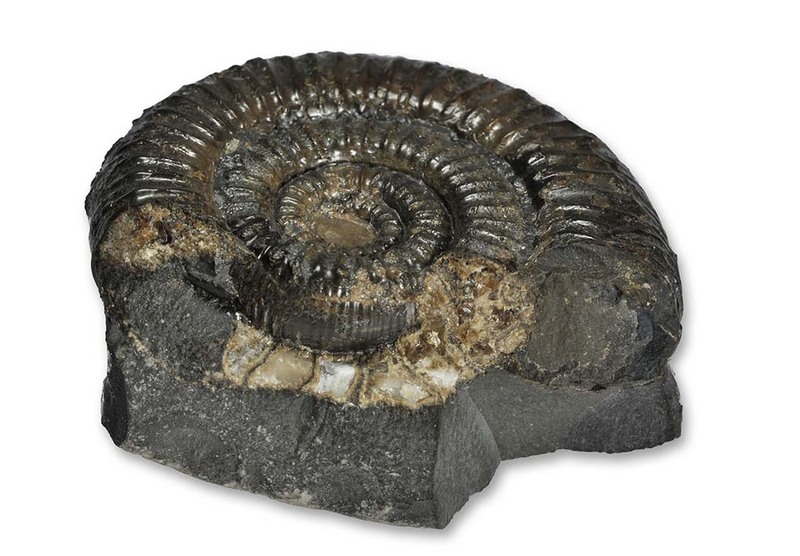 Interestingly, HOWARTH notes that for the holotype of SIMPSON´s Echioceras cereum (a synonym for E. raricostatum), that the exact bed ist not known – the preservation looks exactly like the ones from the block ! This is a block I´ve found myself, and begun preparation, a large E. cf. raricostatoides (about 8 cm) is visible. This is another one, awaiting preparation, found on my birthday this year ! 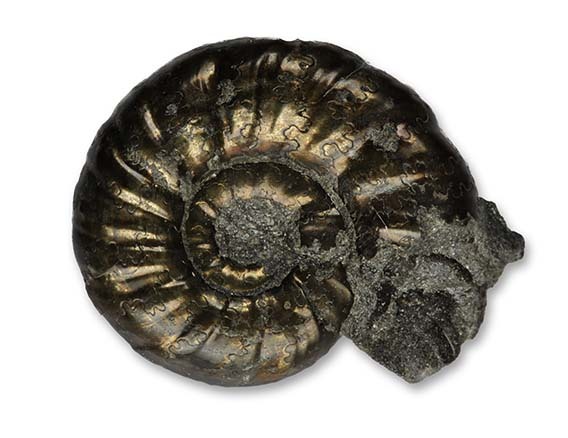 I see similar Ammonites like this one sometimes sold on eBay as “Dactylioceras sp.” – but it is in fact a Zugodactylites braunianus. This misidentification does not happen only to sellers on eBay, in fact Zugodactylites was not known to occur in Yorkshire until the late 1960s (HOWARTH 1978) – I´m sure someone must have found it before ! HOWARTH in his “The Liassic Ammonite Zones and Subzones of the North-West European Province” in 1961 still lists it to be found in Britain exclusively in Northamptonshire. In my collection I did actually recognize it to be something different when I saw the ammonites in the drawer side by side with other Dactylioceratids, and did see the picture in HOWARTH 1961 pl. 73.1 as the closest match I could find. HOWARTHs 1978 paper about “The stratigraphy and ammonite fauna of the Upper Lias of Northamptonshire”, which I got somewhat later, then “officially” confirmed it´s occurrence in Yorkshire. Other characteristica include it´s flatter whorl section, the fine spines at the outer edge of the whorl and it´s pronounced constriction at the aperture. While looking through the Zugodactylites in one of my drawers and comparing them it suddenly dawned on me that there was another species there as well : A Zugodactylites rotundiventer. 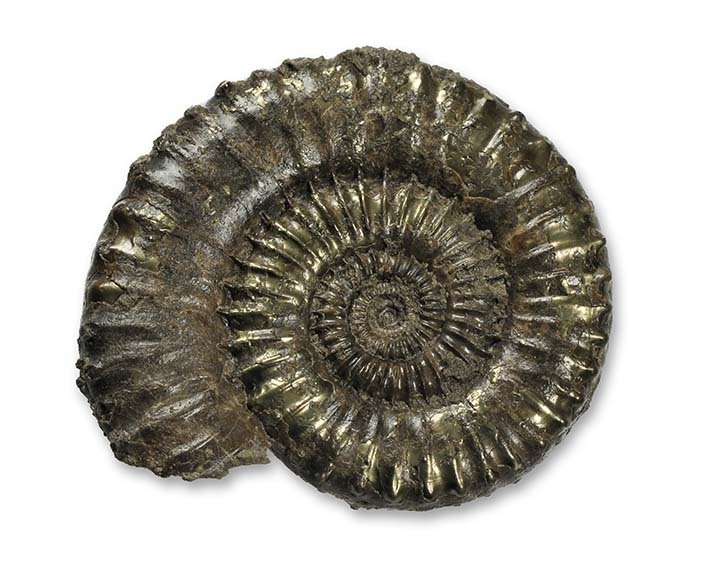 This one is rather large with 90 mm compared to the Northamptonshire ones that HOWARTH mentions – the early jurassic “Yorkshire” seas apparently fed the ammonites better ! As the name suggests, it has a more rounded venter and the whorl is definitely thicker when looking at specimen of same sizes. There´s potentially another species in that drawer : A Zugodactylites thompsoni. It is half an ammonite that I picked up at Ravenscar, nicely showing the wider than high inner whorl. 3 in left upper corner : Phricodoceras sp. 2 in right lower corner : Tragophylloceras sp. 1 in left lower corner and 1 in upper right corner : Coeloceras sp. The larger Coeloceras is about 3 cm in diameter. 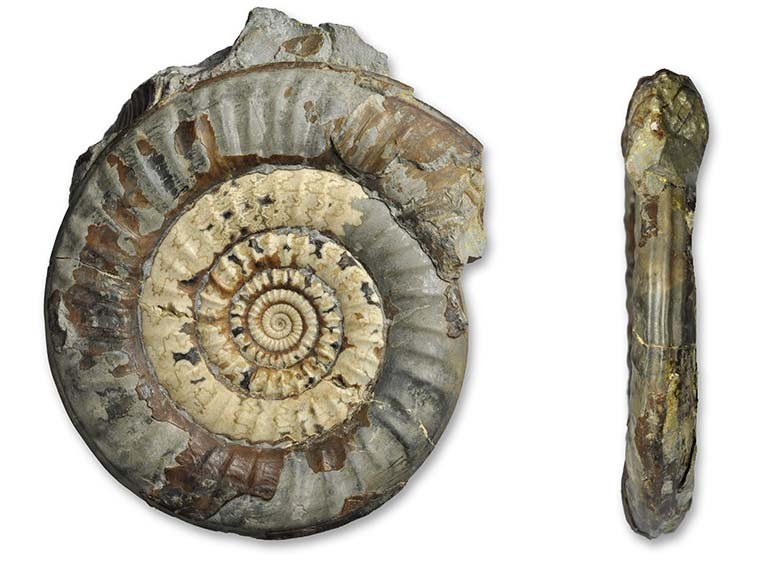 I´m not aware of any Coeloceras having been found at Robin Hoods Bay, so these would certainly fill a gap, especially since they are early Dactylioceratids. I know there are many other species that have been found in the vicinity of Scunthorpe. My only problem is that the stratigraphy around Scunthorpe does not seem to have been described a lot (at least I do not know any descriptions…). So I could certainly photograph and describe the ammonite species (if you meet me when I´m in the UK or let me borrow some of them), but – this is where you folks with the local knowledge about these disused quarries come in – I need you to fill in my gaps about the local geology to make sure we have the correct information to go with the ammonites. So that´s a preliminary “Yes, they´re in”. When collecting fossils, especially in a beach environment like the Yorkshire coast, where you often have to deal with a huge variety of different rocks from different layers, sometimes intermixed with all sorts of glacial drift, recognizing the fine differences of colours of the rocks is of some importance – it helps you pick out the rocks that (from experience) most likely contain fossils, even if they don´t show on the outside. For example when you´re red/green colour blind you´ll have more difficulty picking out subtle greenish shades of some lower liassic rocks. 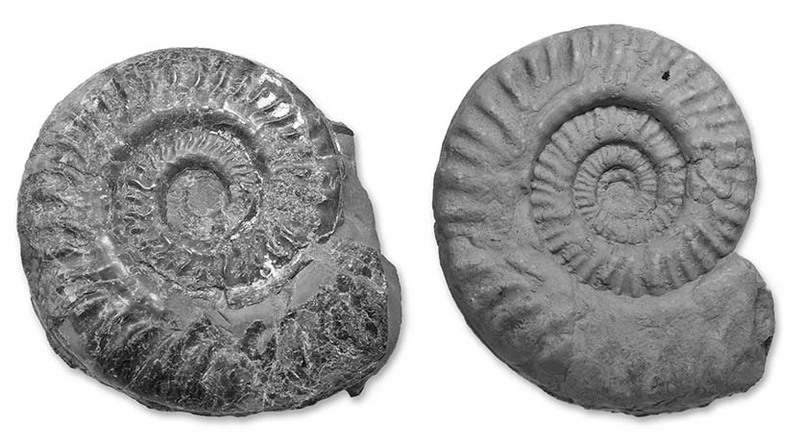 Of course I tricked you here : I intentionally converted the photographs of the two ammonites to black and white, even then I had to modify the exposure of the second picture somewhat to make it look more than the first one. What a difference ! 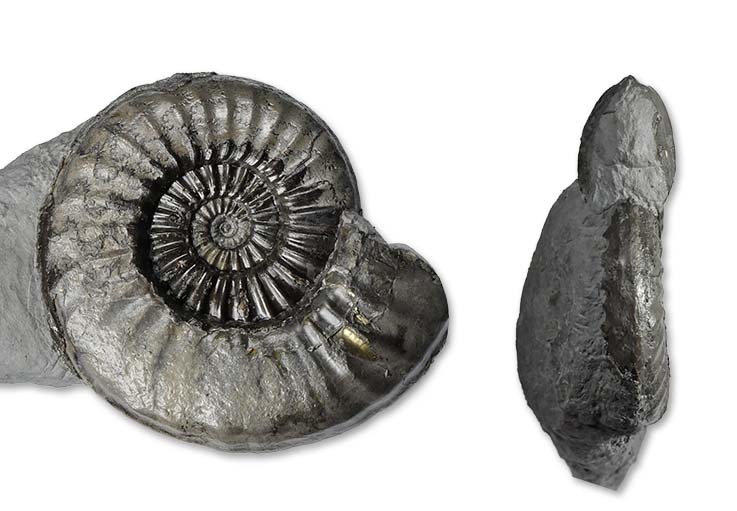 The left ammonite looks very much like a Yorkshire one now, while the right ammonite which is preserved in a strikingly light grey marl is actually from near Cingoli, Italy (specimen swapped against some Yorkshire material with an Italian member of the UKFOSSILS forum – thanks again !). I guess one of the main reasons why many professional palaeontologists in their publications almost exclusively use greyscale photographs is just that : It eliminates colour variations. 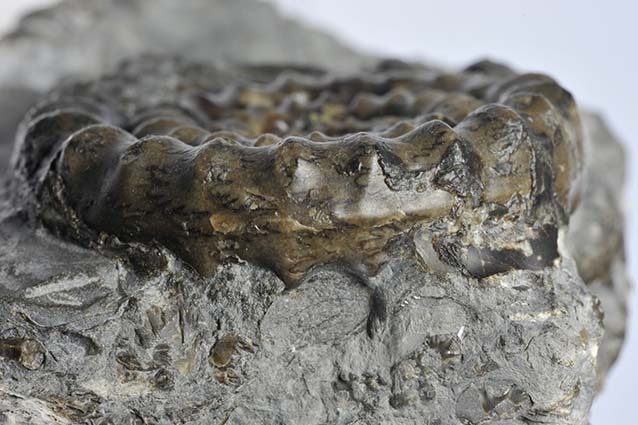 Sometimes fossils are even coated in white ammonium chloride smoke to further eliminate potential reflections, translucency, and greatly enhace surface detail. This way you make specimen more comparable with ones from other areas, removing the unwanted effects of colour due to different preservation. Other reasons may include the relative simplicity of the B/W photographic process compared to colour and the past cost of colour printing. 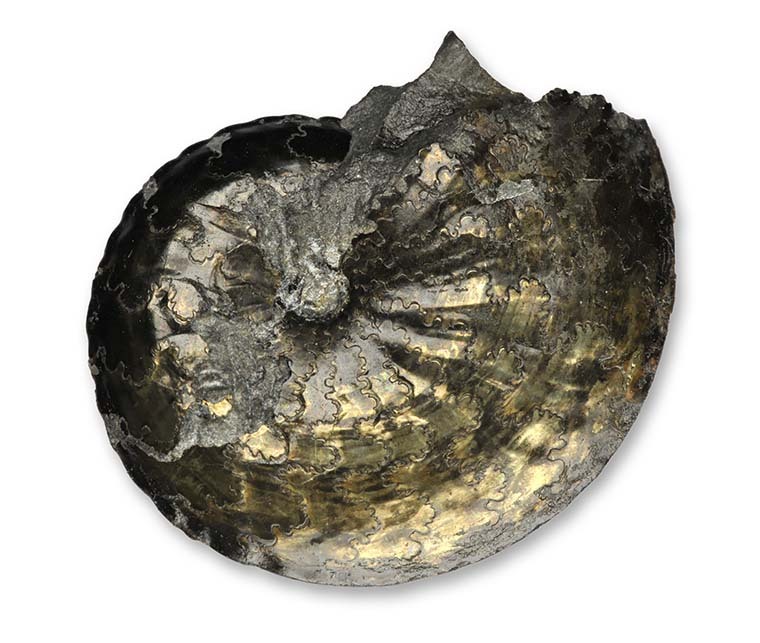 This one is preserved in solid (stable) pyrite and came from the polymorphus subzone, together with a few other finely pyritized ammonites like Tragophylloceras numismale and Polymorphites sp. (more on these later…) Is this the same species as the larger version ? Preservation is certainly very different, the large Radstockiceras is preserved in grey limestone. I doubt my friend Klaus would forgive me if I broke open the large Radstockiceras he loaned me to check if the inner whorls are the same as (the outer whorls) of the smaller pyrite ammonite (if preserved at all…) – Imagine me giving him back a small bag of rubble, saying “Thankyou, here´s your ammonite back, I ckecked something on it, but it came to no result…” ! I guess there would have been a chance to do this – the large ammonite had been broken in the middle when found – but there is no photographic record of what the inner whorls looked like (I feel yet another blog article coming up – photographing your finds shortly after you´ve made them…). 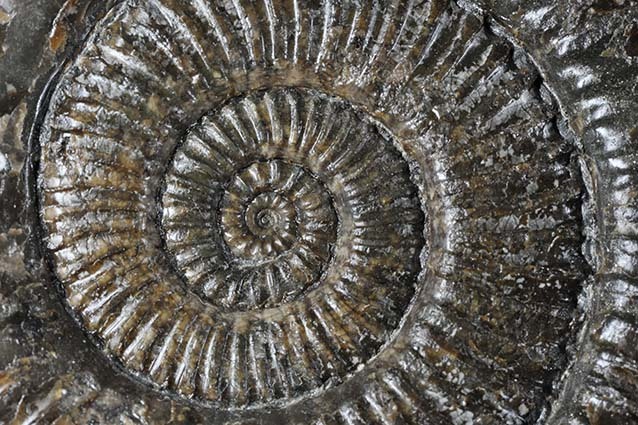 The full list of synonyms even contains different genera (Ammonites, Retenticeras, Metoxynoticeras) as well, painting a picture of more than 150 years of different authors in different locations working on potentially differently preserved ammonites, of (early) branching and (final ?) joining of species names.